Home | Practice Areas | Social Security | When Should I File My Disability Claim? Timing is important in Social Security Disability Insurance (SSDI) and Supplemental Security Income (SSI) disability cases. Many injured workers assume they will start receiving benefits right away — soon after they apply — but this is not the case. If your application is denied once or more than once, and you have to go through the appeals process, your evaluation of benefits can take two years. In the meantime, you may be worried about how to pay the bills. Waiting to apply for benefits can also hurt your claim. By waiting, it appears you are not as injured as you claim, which is not the impression you want to give the doctors evaluating your case. Applying promptly lets you get your benefits sooner and can strengthen your case. Apply as soon as you are eligible. How Do I Know If I Am Eligible to File? Do I Have to Be out of Work a Certain Amount of Time Before I Apply? Are There Reasons to Delay Applying for SSDI Benefits? Do I Have to Notify Anyone Before I Apply? If I Am Receiving Workers’ Compensation Benefits, Should I Wait Until They Run out Before I Apply for SSDI Benefits? Should I Hire a Lawyer to Help Me With the Claims Process? You can apply for Social Security disability and SSI disability benefits as soon as an injury stops you from substantial gainful activity (SGA), which in 2019 is defined as $1,220 a month. The SGA can change yearly so you should check at least once a year to see if the total has changed. If you are earning more than this, you cannot apply. As soon as your injury prevents you from earning that amount, submit your application promptly. Applying as soon as possible has an added benefit. The date you make your disability claim is known as your original disability date. If you successfully appeal any denials, you could be eligible to start getting benefits backdated to that date. The sooner you apply, the more thoroughly you protect yourself. As we noted above, you should apply for SSDI benefits as soon as you have a disability that prevents you from working full-time or making enough money from part-time work. You become eligible for SSDI benefits when your disability is expected to last at least 12 months or longer or if your condition could result in your death within a year. Under this latter scenario, you could be eligible for a compassionate allowance and your SSDI benefits could begin immediately. You have a medical condition that prevents you from working, and doctors believe it will last a year or more or result in your death. The SSA has not denied your application for disability benefits in the past 60 days. The SSA also offers an online Benefits Planner explains in detail the factors that determine eligibility for SSDI benefits. There is also an Adult Disability Checklist and a Disability Benefit Application available on the Social Security website. No. You do not have to be off work for any amount of time before you apply for SSDI benefits. The day you stop working because of a disability that prevents you from making $1,220 a month, you can apply for disability benefits. One of the reasons that it is so important to apply as soon as you can is that applying for disability benefits and then receiving them can sometimes take up to a year or two. The process takes so long because most people are denied on their initial claim. 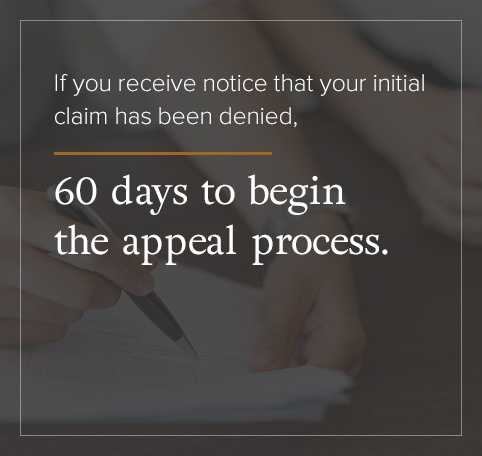 If you receive notice that your initial claim has been denied, you have 60 days to begin the appeal process. Next comes a Request for Reconsideration. These requests have an even lower rate of success for the disabled worker than the initial claim, so if that is denied, you can then apply for a hearing from an Administrative Law Judge (ALJ). There is a much higher rate of success for claimants at this point in the process. Almost two-thirds of people who apply for SSDI benefits and are rejected on their initial claim will be successful at an ALJ-administered hearing. If your appeal is still turned down, you can then take your case to an SSA Appeals Court and then to the federal court system. This means the process can take several months to a year before you are eligible to receive benefits. The reason that applying as soon as possible is important is that once your appeal has been approved, your disability payments are backdated to the date you filed your initial claim. You could lose several months of possible benefits if you hesitate to apply. For many disabled workers, the greatest problem they face is being able to pay their bills while they are waiting through the appeals process. Workers who wait to apply until they have been off the job for several weeks or several months may have already burned through any funds they have saved for a rainy day situation like this. When you apply for SSDI benefits sooner rather than later, your rainy day funds may be enough to get you through the appeals process. Social Security may believe that you can still do some form of work activities if you continue to work part-time or have worked on and off while applying for benefits. Remember, if you earn the SGA level of $1,220 a month, Social Security does not consider you disabled. Most states require you to be willing and able to work and to continue to look for work to receive unemployment benefits. States will often require that you submit a log of all the attempts that you made to find work during the period that you are receiving unemployment benefits. This, of course, can interfere with the SSA’s requirement that you cannot work to receive SSDI benefits. In many cases, it is better to wait until you are finished receiving unemployment benefits before you apply for SSDI benefits. There can be circumstances, however, when you can collect both benefits at once, but before you try to do this, we recommend speaking with an experienced Social Security benefits lawyer who understands how the system works. One of the critical documents that you need to submit to the SSA to receive SSDI benefits is a Residual Functional Capacity (RFC) rating. This is an important medical form prepared by your doctor for the SSA which helps them to determine any physical or mental limitations caused by the disability that prevents you from working. If you have not seen a doctor regularly for treatment, it can be difficult for them to prepare an RFC document for the SSA. If you have hesitated to see a doctor, it also means that the SSA is less likely to treat your disability seriously. If you cannot afford a doctor, the SSA will schedule a consultative exam for you with a doctor who works for Social Security. Chances of being approved for benefits, however, are not good when they are based on a consultative exam. If you cannot afford to see a doctor, try to see one at a free clinic in your area. If you delay filing for any of the reasons mentioned above, it is possible to receive what is known as a Protective Filing Date. Call the SSA office closest to you and tell them that you will be filing a disability application sometime within the next few months. You can also send them a letter notifying them of the same thing. If you file for disability benefits within six months of when you notified the SSA, the protective filing date is viewed as your application date. As we noted above, your application date is important because that is the date that the SSA will use to calculate your benefits if your claim is ultimately successful. No, you do not have to notify anyone before you apply for SSDI benefits. In most situations, people quit their jobs before they apply for SSDI benefits. Remember, if you are still working and receiving more than $1,220 a month, Social Security will most likely deny your claim. You should advise your doctor, however, that you intend to apply for SSDI benefits so they can begin to prepare the proper paperwork and documentation to help you. When you apply for SSDI benefits, you need to include a work history with the specific dates for each job over the last 15 years. An SSA examiner or ALJ will simply consult this list. In most cases, they will never contact your previous employers. If they do, it is often to learn more about what your duties were on your past job, rather than to find out your condition while you are working there. If you continue to work but earn less than the $1,220 a month claim, you can apply for SSDI benefits. If your employer, however, has made special accommodations for you to be able to continue to work at this reduced level, the SSA may subtract the value of these accommodations as it counts towards your income. In that case, you may be able to earn more than the $1,220 amount. Before you do this, however, we advise you to consult with an experienced Social Security disability claim lawyer. On the other hand, if you earn the minimum wage and are working 25 to 30 hours a week, Social Security may consider you able to work even if you are earning below $1,220 level. Again, we advise you to consult an experienced Social Security disability lawyer if you find yourself in the situation. If you are receiving SSDI benefits and you go back to work even part-time, you do not have to tell your employer that you are receiving these benefits. You must, however, notify the Social Security Administration that you have returned to work. No, you should not wait. First, as of noted above, the application process for SSDI benefits can last anywhere from a few months to two years. In some cases, you can receive workers’ compensation benefits and SSDI benefits at the same time, although it may affect how much you are receiving overall. Again this is a case where it makes sense to consult an attorney who has experience in workers’ comp and SSDI cases. Waiting for workers’ comp benefits to run out before applying for SSDI benefits can put you in a financial pickle. If you wait to apply, you may put yourself in a situation where you need to find other funds to survive until your claim is approved. Yes. It can make a great deal of difference. If you hire an attorney to help you with the SSDI application process, you are three times more likely to be successful than someone who applies for benefits but does not work with an attorney. An attorney can help you with all of your eligibility questions such as the right time to file, what to do if you are still working part-time or if you are receiving unemployment benefits or if you are disabled and then get a job that pays more than the $1,220 a month SGA level. An experienced attorney will make sure that all of your papers are filed on time with the appropriate documentation, help track down the medical records that you need to prove your case, help you decide if you need to call witnesses during appeals hearing and advise you on any other matters that arise. You should also know that benefits lawyers work on a contingency basis which means they do not get paid until you get paid. By law, a lawyer can only receive 25 percent or $6,000, whichever is lower, for their work on SSDI benefits case. If you are intimidated by filing a social security disability claim or have applied and been rejected, contact KBG Injury Law. The attorneys at KBG Injury Law focus on SSI and Social Security benefits and would be pleased to offer you a consultation. You can call us at 1-800-509-1011 or visit our contact us page where you can leave us your contact information and tell us a little bit about your situation. A member of our team will contact you as soon as possible.